Mr. Ito (Deputy Executive Director) and Dr. Nakajima (Manager, Dept. of International Affairs) visited headquarters of National Center for Scientific Research (CNRS) in Paris on March 10th, 2016. They discussed so far joint activities between CNRS and JST, and confirmed the results that have been made by Ms. Sandrine Plaud-Guerin for EIG CONCERT-JAPAN. The third joint call for proposal has been started from February 10th on “Food Crops and Biomass Production Technologies”, and five countries (Germany, Spain, France, Turkey and Japan) are participating for the call. Both the U.K. and Japan have strong standing positions in this field of 2-dimensional device applications and have been prioritising it as a strategic research area. The UK-Japan Workshop on Advanced Materials was held in York on February 24th and 25th, 2016, co-organized by the Department of Electronics, University of York and the JST Paris Office, and supported by the Embassy of Japan in the UK. The workshop comprised two discussion sessions, enabling all participants, including English and Japanese researchers from advanced materials fields, to exchange knowledge and ideas through the presentations their research. Training for Japanese University Research Administrators and EU researchers. “Opportunities for EU-Japan Research Collaboration” was held in London on February 22nd, 2016, organised by some members of JEUPIST project (Kobe University, APRE, FORTH). At this one-day Seminar in the Hotel ibis London Euston at St Pancras, the JST Paris Office made a presentation and introduced an overview of JST’s international activities, including recent joint Calls for Proposals that were launched in cooperation with the EU Framework Programme for Research and Innovation: Horizon 2020. The Japan-UK Robotics and Artificial Intelligence Seminar 2016 hosted by the Embassy of Japan in the UK was take place in London on 18 February 2016. The event was supported by JETRO (Japan External Trade Organisation), British Embassy of Tokyo, the EPSRC UK-RAS Network and the JST Paris Office. The detailed programme can be found here. The annual meeting of Belmont Forum was held in Oslo, Norway from October 14th to 16th, 2015 and was hosted by the Research Council of Norway (RCN). The Belmont Forum, a group of funding agencies and international scientific organizations from all over the world, aims to support international cooperative research on environmental change through Collaborative Research Actions (CRAs). JST has been supporting several projects in the calls “Food Security and Land-Use Change”, “Scenarios of Biodiversity and Ecosystem Services” and “Arctic Observing and Research for Sustainability”. Ms. Shirokizawa, Executive Director of JST, was elected as one of the six steering committee members in the meeting in Oslo. It was announced that Mr. Ohtake will come to the end of his term as co-chair of the interim steering committee of Belmont Forum by the end of December. He will be replaced by Dr. Camara (Sao Paulo Research Foundation FAPESP), who will take over Mr. Ohkate’s responsibilities and work together with the other co-chair Dr. Vandenberghe. Furthermore, Ms. Takeuchi, researcher at JST, has been appointed as deputy director at the Belmont Forum secretariat established in the French National Research Agency (ANR). 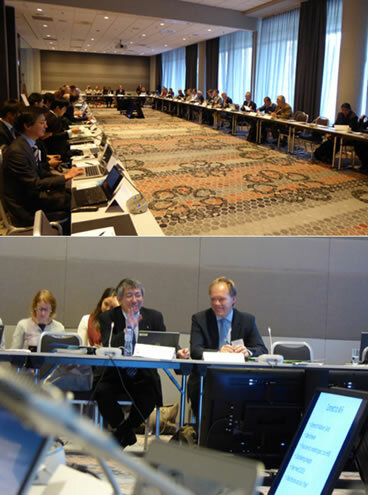 The EIG CONCERT-Japan Joint Call Preparatory Meeting took place in Budapest, Hungary on 10th September 2015 co-organized by the Regional Center for Information and Scientific Development (RCISD) and JST. The European Interest Group (EIG) for Japan was established in December 2014 as a flexible platform for the continuation of the CONCERT-Japan (Connecting and Coordinating European Research and Technology Development with Japan) project, which was conducted in the FP7 between 2011 and 2014. The successful meeting was held in the Institute for Foreign Affairs and Trade (IFAT). 12 participants, representing 5 countries including Japan, gathered to discuss the final steps before launching the next CONCERT-Japan joint call in November. Overall, there was a common consensus about the way to proceed and all institutions were pleased to have the opportunity to collaborate and work together again in the new framework of EIG CONCERT-Japan. The JST Paris Office was invited to attend the Garden Party on June 25th 2015 in Paris hosted by H.E. Ambassador Kazuo Kodama, the Permanent Representative of Japan to the OECD. 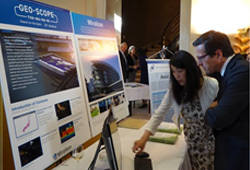 To the roughly 500 attendees, including representatives of the OECD Member countries, we introduced an interactive board known as GEO-SCOPE , designed by the Miraikan, which allows you to access various Earth observation data collected by domestic and international scientists and institutes. 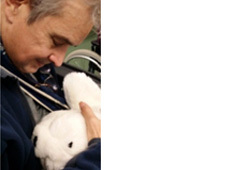 The therapeutic baby seal robot PARO was also demonstrated by Dr. Takanori SHIBATA of the National Institute of Advanced Industrial Science and Technology (AIST). JST funded Dr. SHIBATA’s research on the interactions between robots and human beings under PREST, SORST and SICP. 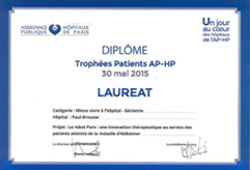 Dr. SHIBATA explained PARO’s contribution in winning the 2015 Patient's Trophy of AH-PH (L'Assistance Publique – Hopitaux de Paris) in May 2015. Japan Science and Technology Agency (JST) and the Ecole des hautes etudes en sciences sociales (EHESS)*1 signed a Memorandum of Cooperation (MOC) on June 3rd, 2015 in Paris to establish a comprehensive collaboration. 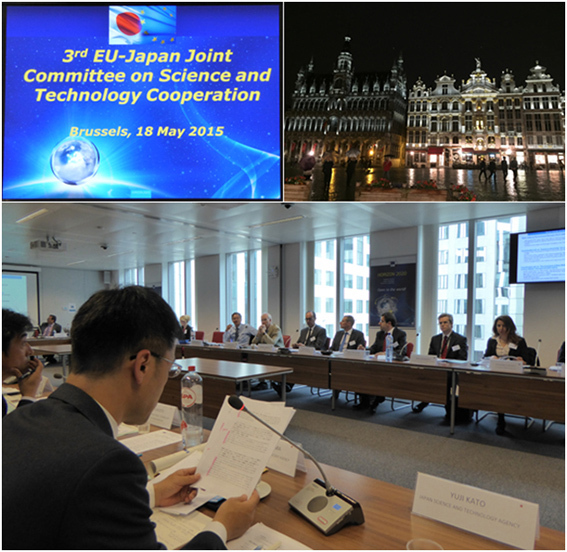 The 3rd Japan-EU Joint Committee on Science and Technology Cooperation was held in Brussels on May 18th, 2015. The Japanese delegation attending the meeting consisted of representatives from ministries, funding agencies, and research institutions led by H.E. Makoto Katsura, Ambassador for Science and Technology Cooperation of the Ministry of Foreign Affairs (MOFA) of Japan. Dr. Nakajima (Manager, Dept. of Foreign Affairs) introduced JST-EU cooperative activities for the field of materials and made a presentation on future actions entitled ‘Coordination and mechanisms for joint funding of projects/initiatives’ during the JCM. Dr. Ichioka (Senior STI Cooperation Strategist, Office of International Strategy) introduced the activities of the JEUPISTE program which has been supported by FP7. After the meeting at Brussels, they and Mr. Gadsden (Researcher, Dept. 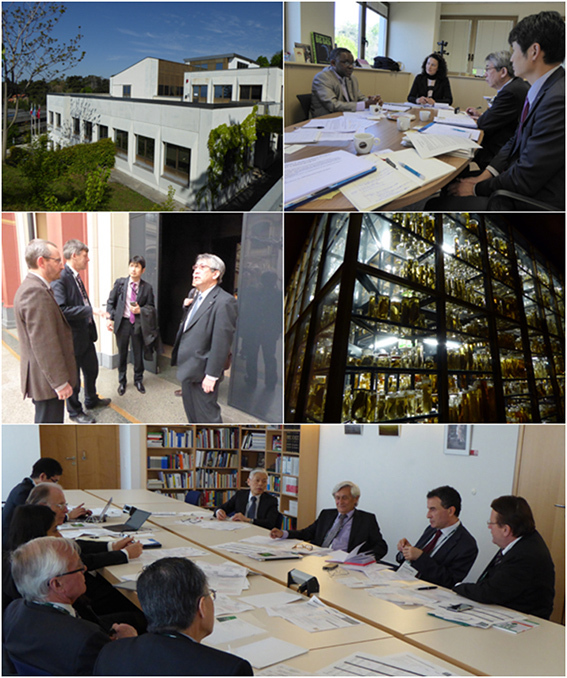 of Foreign Affairs) visited CNRS and ANR in Paris to discuss future collaborative activities. 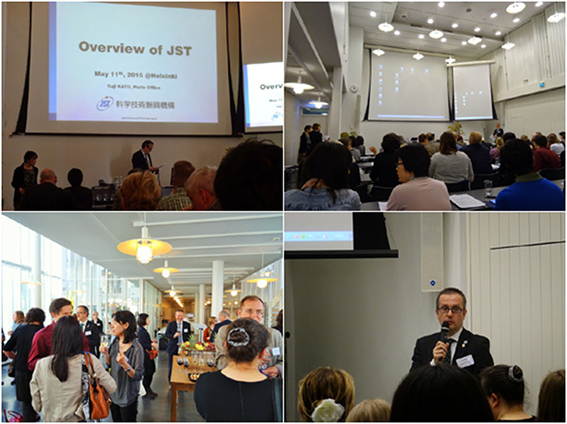 The ‘Research and Study Possibilities in and on Japan’ Symposium was held in Helsinki on May 11th, 2015, organized by Hokkaido University Helsinki Office, Embassy of Japan and JSPS Stockholm Office. Mr. Kato (Director, JST Paris Office) attended the symposium and introduced the JST’s international activities. The White Paper Workshop for German-Japanese Cooperation on Nanotechnology was held in Stuttgart on April 22nd, 2015, co-organized by the Fraunhofer Institute for Manufacturing Engineering and Automation IPA, Cluster Nanotechnology and Network for Science. Mr. Ohtake (Senior Executive director) and Mr. Ohama (Director, Office of International Strategy) visited Europe to meet with several agencies to discuss potential future collaboration. They visited the Directorate-General for Research and Innovation (DG-RI) in Brussels to discuss the collaboration with Horizon 2020 and Belmont Forum. They also visited the World Academy of Sciences (TWAS) in Trieste to talk about the invitation program for African researchers to visit Japan. The delegation, including Prof. Arimoto, visited Robert Bosch Stiftung to meet with Prof. Anne Glover (former Chief Scientific Advisor to the EC) and went to the Museum fur Naturkunde in Berlin. They also attended the Council Meeting of the Science and Technology in Society forum (STS forum) to discuss the program for the 2015 STS forum. Copyright © 2013 JST Paris. All Rights Reserved.